Whenever the cone flowers blooms, there are butterflies on them, tiny one, larger ones and sometimes even large swallowtails. They must find something particularly attractive about these flowers. 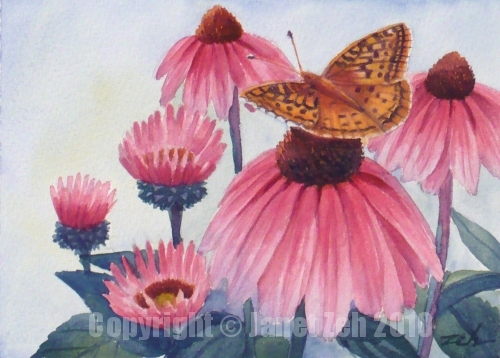 Here in soft pastel colors, I've painted them along with a Great Spangled Fritillary butterfly that is common in my garden and a frequent visitor to cone flowers when they are in bloom. You can find my original flower paintings and prints for sale in my Etsy shop, JanetZeh.Etsy.com. Thanks for stopping by and have a delightful day!